How to create user defined data types using structure? 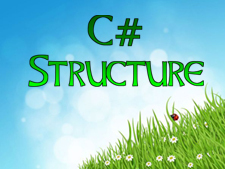 How to implement structure in C# programming? The structure is the value type data type that can contain variables, methods, properties, events and so on. It simplifies the program and enhances the performance of code in C# programming. The structure encapsulates a small group of related variables inside a single user-defined data type. It improves speed and memory usage and also enhances performance and clarity of your code. How to use structure in C#? It is very simple to use a structure in C#. The following programming example will show you to how to create and use a structure in C# programming. In the preceding example, we create a structure named book that contains three variables as bookname, price, category. These variables can be accessed by creating the object of book structure. Next, we create two variables of book as language and database. Then store the value in language and database and display the value on console. In this chapter you learned what structure is and how to use it in C# programming. In next chapter you will get some programming examples.